With nine members of the Dunsky team in attendance, this year’s ACEEE Summer Study is in full swing! 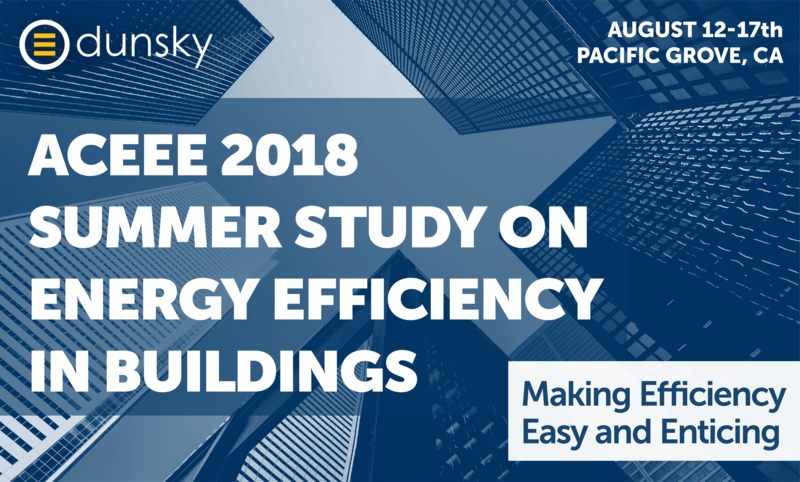 The biennial Summer Study is among the foremost gatherings of energy efficiency thought leaders and professionals, and this year’s focus is on the challenges faced by the building industry. This week, Dunsky is presenting and discussing four papers on innovative strategies, emerging technologies, and shifting landscapes in energy use and climate impacts. Energy efficiency financing programs can be a valuable tool to overcome customer barriers, but their impact on efficiency portfolio costs – and cost-effectiveness – is poorly understood. This paper draws from substantial work conducted for jurisdictions from coast-to-coast. In asking whether financing programs increase or decrease portfolio-wide cost-effectiveness, the answer appears to be: Yes. Utilities have an important role to play in supporting the electrification of transportation; whether through deploying fast charging infrastructure, enabling vehicle-grid integration, or simply educating their customers about the potential benefits of electric transportation. Building on our experience in the energy efficiency sector, Dunsky has developed a technical reference manual for transportation efficiency measures, as well as EVA – our electric vehicle (EV) Adoption model – which allows utilities and governments to assess the extent to which different program and policy levers are likely to accelerate demand for EVs, as well as the resulting costs, revenues, and business cases. By bringing a rigorous, methodical approach to understanding EV opportunities, these tools will enable utilities to build cases for aggressive programs and move the needle on electric transportation. Many program administrators aim to transform markets, but are they able to achieve it and if so, can this transformation be measured? Over the last 20 years, Hydro-Québec deployed a range of interventions to transform the market of electronic thermostats for residential electric baseboard heating. This paper demonstrates how they have successfully done so and provides insights on the methodologies used to measure this market transformation and associated energy savings. Philippe Dunsky – Canada: The New Efficiency Frontier? For the first time in decades, energy efficiency is front and centre in the Canadian policy landscape. This paper describes the widespread activity taking place north of the border, including a province-by-province activity map, and a presentation of the policies creating new program funding sources. The paper also discusses pressing challenges such as mainstreaming efficiency, establishing stable funding mechanisms, and enacting tough new codes and disclosure requirements. Attendees will leave with a clear view of the tremendous policy activity taking place north of the border, and with inspiration for approaches that could well be transferred to the U.S.